This tutorial will go through the steps for installing player/stage on OS X. We’ll work through any issues encountered along the way, and verify the stage installation. The tutorial won’t go into verifying the player installation against any hardware. -h             : print this message. -d      : debug message level (0 = none, 1 = default, 9 = all). -q             : quiet mode: minimizes the console output on startup. error   : Failed to load plugin stageplugin. There are a couple of related issues posted for the playerstage-player MacPorts port (22642, 23179, 26048, 26329), and my suspicion is that it has to do with compiling with x86_64 architecture in OS X 10.6. It seems like one can try to build the macports using different options to get around the architecture issue, or try building player from source. I’ll post an update if I figure it out. Note: On Snow Leopard, this install took forever for me. I did have some internet issues in the middle of the install, but it still took most of the day to build. So I would recommend being patient here. Since /opt/local/bin should already be on your path, you shouldn’t have to do any extra setup to access the executable. 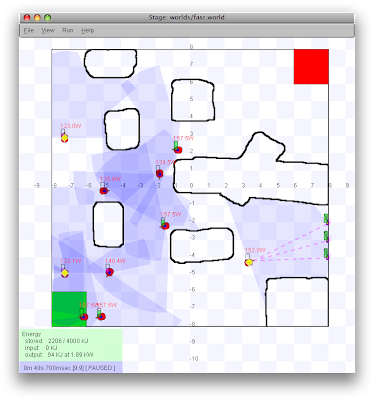 At this point, you want to try running stage against an example world. However it seems that the DarwinPorts installation doesn’t install any worlds under /opt/local/share/stage. So you can go to the player/stage SourceForge site and download the latest stage source archive. Extract the archive and copy the worlds directory to /opt/local/share/stage. We still have issues. It looks like the version of libjpeg.dylib on our library path is a different version from what ImageIO is expecting. Maybe there was a transitive dependency in the DarwinPorts install that’s screwed us over, who knows. Anyway, if we point to OS X’s version of libjpeg, maybe we’ll eliminate this issue. Try holding the ctrl key and moving your mouse cursor around to change the view. You can also press “p” to unpause the simulation. A window should pop up. Press “p” and watch the robots move around. This verifies that the stage plugins are working. With 10.6, I had a much easier time installing for some reason (perhaps because I used MacPorts instead of DarwinPorts?). The only issue I found was that the STAGEPATH variable was not set, so I set that and was good to go. 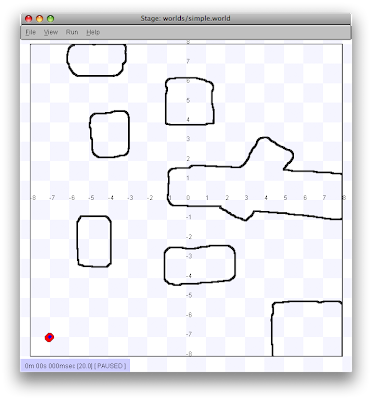 Unfortunately, while the stage plugin seems to work, the player port is broken on OS X 10.6 (see the top of this post). Thanks a lot your posting. But $player simple.cfg doesn’t work. The error message is that stageplugin fail to load. Yes, you’re right. I think I posted the update for 10.6 too soon, because I am having the same issue as well. It seems like stage can run fine, but running stage via player doesn’t work. I will post an update once I figure out a resolution for this.